1. Will mBlock 5 replace mBlock 3 that I previously installed? 2. I get a blank white screen when I start mBlock 5 in Windows. Why? 3. Is there a beginner’s guide to mBlock 5? 4. Where can I find teaching resources? 5. Why did I fail to connect devices to mBlock 5? 6. Can I view the Python code in parallel with coding blocks in the latest version of mBlock 5? 7. Where do I upload the cloud data? Does cloud data have anything to do with Class Management/Resource Management? 8. Is the cognitive service only available for sprites? Is it available for devices? 9. Is the machine learning feature only available for sprites? Is it available for devices? 10. Is the pen only available for sprites? Is it available for devices? Can it control the servo? 11. Does mBlock 5 support language processing? 12. I want to help you translate the strings of Makeblock apps into my native language. Can I make it? 13.After uninstalling mBlock 5, I reinstalled mBlock 5 and opened it. However, when I tried to connect my device to the software, I was told “Driver installation failed”. How to solve it? 14. Can “My blocks” work across sprites in the mBlock 5? 15. Are there any CPU and memory requirements for installing mBlock 5 Desktop? 16. Any recommendations on which browser to use if I want to run the mBlock 5’s online editor? 17. How to check the Bluetooth version of my Windows PC? 18. 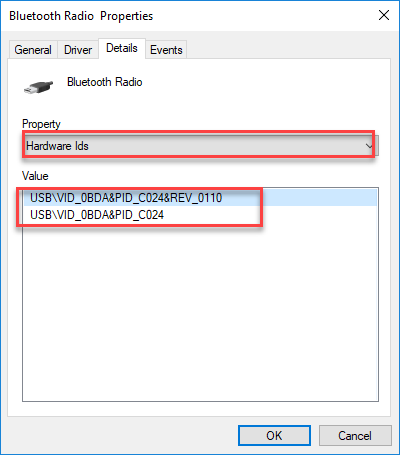 How to install Bluetooth 4.0 driver on my Windows PC? 19. 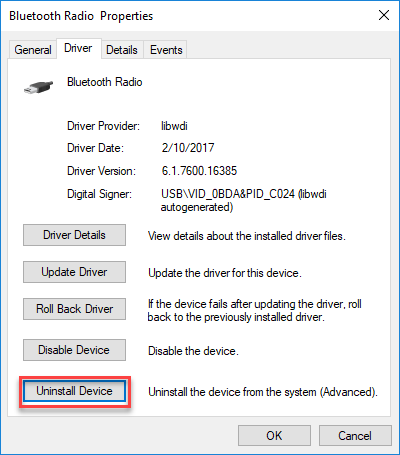 How to uninstall Bluetooth 4.0 driver on my Windows PC and restore system Bluetooth? No, it won’t. Both of them will be stored in the computer. You can use mBlock 3 and mBlock 5 at the same time. Your graphics driver version is too low. You should upgrade the graphics driver. Please refer to the Quick Getting Started to mBlock 5. 3）Windows users：Go to the root directory where mBlock 5 is stored and double click mblock5/drivers/Driver_for_Windows.exe to install the ch340 driver manually. Restart the computer when finishing the installation. You can view the Python code in parallel with the coding blocks of the stage; if you are programming Codey Rocky, then you need to add the event block, “when Codey starts up”. 2）The cloud data has nothing to do with Class Management/Resources Management. It’s not directly available for devices, but devices can use the cognitive service data through Broadcast or Communication Variable. It’s not directly available for devices. It should work with the Broadcast or Communication Variable to support devices. No, it can’t control the servo. mBlock 5 has the cognitive service feature, which supports text recognition and speech recognition. Install the following service pack and then reinstall mBlock. During the installation process, keep the device (mBot or Codey Rocky) connected to your computer. Then install the driver on your computer. You can sync “My Blocks” across sprites by dragging or duplicating the blocks. There are no specific CPU and memory requirements. All you need is an OSX system or a Win 7 system (or higher). 1) Press Win+X to open the Start Menu and select "Device Manager". 2) Under "Bluetooth", you will see several Bluetooth devices. 3) Select your Bluetooth brand and right click to check the "Properties". 4) Go to the "Advanced" tab and check the firmware version. The LMP number shows the version of Bluetooth your PC is using. 2) Run Zadig tool, choose "Options" and click "List All Devices". 3) Choose your device from the drop-down list and click "Replace Driver". After the installation is complete, if Bluetooth 4.0 connection is not working, one possible reason is that the bluetooth module of your computer is not support by mBlock 5. Please contact support@makeblock.com with the Hardware Id of your PC&apos;s bluetooth. Our engineer will update the bluetooth support library. After the update is done, you can restart your mBlock 5 to use Bluetooth 4.0 connection. 2) Under "Universal Serial Bus devices", find "Bluetooth Radio". 3) Right-click "Bluetooth Radio", and choose "Properties". 4) Select "Details", and choose "Hardware Ids" from the Property drop-down list. 4) Select "Driver" and then click "Uninstall Device". 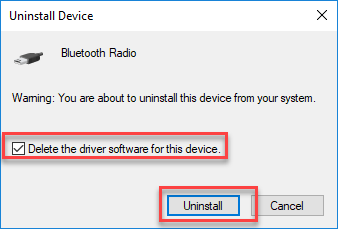 5) Check the box of "Delete the driver software for this device", and then click "Uninstall". 6) After the uninstallation is complete, restart your computer.